ROMAN NUMERAL RINGS : BRITISH Made : LOVE2HAVE in the UK! Domed profile wedding ring available in various widths made from black zirconium with a personalised Roman Numerals outer engraving. Flat profile wedding ring available in various widths made from zirconium with a personalised Roman Numerals outer engraving. 7mm width flat profile wedding ring made from zirconium with a personalised Roman Numerals outer engraving. The BEST! Roman numeral rings made from titanium or zirconium in the world and all made here in the UK. 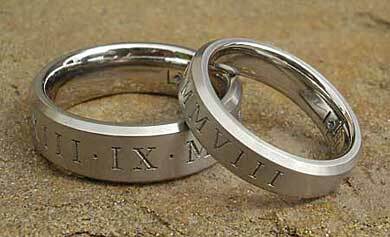 All the rings in this section come with their very own FREE personalised Roman numeral engraving. These rings, therefore, make the ultimate choice for a custom wedding ring or a special occasion. The engravings on all of our Roman numeral rings are created using computerised laser technology. We can accurately and mathematically correctly engrave the Roman numerals of your choice around the outside of your Roman numeral ring. The spacing of the Roman numerals are not an issue either, and you may specify this option too. We are very confident in that not only do we provide the BEST Roman numeral rings made here in the UK (and probably the world) but also at the LOWEST PRICES too. If you think you may have seen the same Roman numeral ring elsewhere at a lower price, let us know, and we will price match like for like. YES! We can BEAT anyone!